The usd to cad pair continues it’s erratic move sideways, and Friday was no exception. Following the two bar candle pattern of Wednesday and Thursday, we did indeed see prices rally on the final day of the week, with a fall later in the afternoon, and as a result we have a shooting star candle with a small body and large upper wick. It is interesting to note that prices have opened higher this morning in early trading and are currently crossing the 9 and 14 day moving averages. My suggestion for today would be to stay out of the pair, until we have a confirmed direction, which will only become evident once we have broken out of the current sideways range, which although wide, is very difficult to trade. 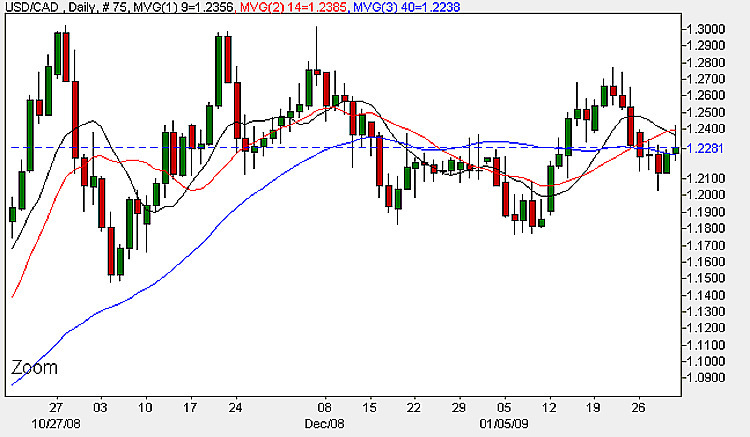 Again, if you must trade today attempt small longs with stop losses above 1.2720. As it is the start of a new month I will look at the weekly and monthly charts later, to see if we can identify any longer term trading opportunities. The main numbers out today for the US dollar are those of the ISM ( Institute of Manufacturing ) released this afternoon. This is a survey of about 400 purchasing managers which asks respondents to rate the relative level of business conditions including employment, production, new orders, prices, supplier deliveries, and inventories. It is a leading indicator, and with a figure above 50 shows an industry in expansion, and below 50, one in contraction. Last time the figure was 32.4, with a forecast for the same this afternoon. If the forecast is exceeded by the actual, then this is generally considered good news for the home currency. There is no fundamental data being released in Canada today.